This seems like an oddly schizophrenic approach, but it works fairly well for the most part. As an action film, First Blood provides a reasonably tight experience that follows the Rambo against the world story. The film features little plot, but it maintains a good sense of drama as it progresses, at least until it runs toward its conclusion. The last act contains some improbable and excessive acts, especially in the way Rambo turns against the whole town. Why did he decide to blow up a gas station and some other elements? This made no sense; his beef was with Teasle and his ilk, so why go after the general population? 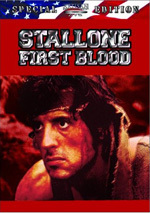 First Blood appears in both an aspect ratio of approximately 2.35:1 and in a fullscreen version on this double-sided DVD-14; the widescreen image has been enhanced for 16X9 televisions. Only the letterboxed picture was reviewed for this article. Frankly, I didn’t expect much from this picture, as many flicks of the era haven’t held up well. To my surprise, the image looked very good, with only a few problems along the way. Sharpness seemed solid for the most part. At times, some wide shots displayed a little softness, but this never became a significant issue. The picture usually looked nicely crisp and detailed. Jagged edges and moiré effects created no concerns, but I did notice some light edge enhancement at times. Those haloes never seemed severe, but they were apparent on occasion. Print flaws appeared surprisingly minor. The image showed some light grain that likely came from the original material, and I also noticed the occasional speckle. Otherwise, the material looked nicely clean and fresh and didn’t betray its age. First Blood featured a subdued, naturalistic palette, and the DVD replicated those hues nicely. The colors came across with good accuracy and depth, and they showed no signs of noise, bleeding or other issues. Black levels came across as dark and dense, while shadow detail seemed appropriately heavy. Some forest scenes looked a little dark, but that resulted from the photographic style; those shots showed heavy contrast between the bright light in the background and the participants, so the darkness was inevitable. First Blood dropped below “A” level mainly due to the edge enhancement, but overall, this was a very solid image. To my surprise, First Blood offered both Dolby Digital 5.1 and DTS 5.1 soundtracks. To my greater surprise, I heard a significant difference between the two that favored the DTS mix. I’ll discuss that one first and then summarize the variations I discerned. The DTS soundtrack provided a fairly solid soundfield. The forward spectrum dominated the proceedings and offered reasonably good spread across the front. Music showed nice stereo presence, while effects moved cleanly and accurately across the channels. The surrounds added occasional reinforcement, and they also became more active during a few scenes; helicopters would zoom from front to rear, and dogs barked in the back. However, the front presented the strongest presence, and the track seemed to offer a reasonably involving soundfield. Audio quality showed its age at times but seemed pretty solid for the most part. Speech sounded slightly thin on occasion, and a little edginess appeared. However, dialogue generally was distinct and natural, and I discerned no problems related to intelligibility. Effects displayed minor distortion at times, mainly due to gunshots. Otherwise they seemed fairly clean and accurate, and some elements like explosions and thunder showed good low-end response. Music seemed acceptably bright and dynamic, as they score also displayed decent bass. How did the two tracks differ? The DTS mix seemed considerably more lively and engaging. For the Dolby Digital version, music appeared almost monaural, as the score barely spread past the center. Effects transitioned less cleanly between channels, and the surrounds played a less active role; those elements seemed more sterile and less involving. Audio quality also came across as thinner and less robust. The track still seemed fairly good for its age, but the DTS mix displayed a significantly more vibrant and vivid auditory affair. This new release of Rambo III provides a modest mix of extras. 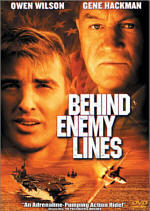 We get an audio commentary from novelist David Morrell. According to the credits, Morrell had no direct involvement in the movie; they based it on his book, but that was that. Because of this, I didn’t expect much from the commentary other than a comparison of the two, and I thought this would be a bland piece. I was wrong on both accounts. Yes, Morrell does tell us many differences between novel and film, but he also adds a slew of great production notes and anecdotes about the film. He possesses a wealth of knowledge about the movie - and the rest of the series, it appears - and he offers an engaging and lively personality. Almost no dead spaces appear, and Morrell only occasionally tells us what we see on the screen. Usually he interjects a quick statement in that regard but then quickly returns to his story. Folks who like commentaries that stick heavily to the onscreen action might not like this one, but I think it provides a consistently entertaining and informative piece. Next we find Drawing First Blood, a new 22-minute and 32-second documentary about the movie. The program mixed shots from the film, production stills and other archival materials, and recent interviews with participants. In the latter area, we hear from director Ted Kotcheff, novelist Morell, executive producers Andrew Vajna and Mario Kassar, producer Buzz Feitshans, and actors Sylvester Stallone and Richard Crenna. Despite its brevity, the program offers a very nice look at the production. It traces the film from its origins as a novel through early attempts to make it, casting, and various aspects of the shoot. We see some stills from an unused ending, and also check out a poster that featured Kirk Douglas in Crenna’s role, but unfortunately, we don’t watch any actual footage of either. Nonetheless, “Drawing” provides an entertaining and informative piece that seems consistently enjoyable. A few minor extras round out the disc. We get both teaser and theatrical trailers plus some text materials. The Production Notes offer a solid look at the story’s roots as a novel and covers many interesting elements of its progression to the screen. Cast and Crew includes listings for director Ted Kotcheff, executive producers Andrew G. Vajna and Mario Kassar, producer Buzz Feitshans, and actors Stallone, Richard Crenna, Brian Dennehy and David Caruso. The quality of the entries varies - Stallone’s is easily the most detailed - but all offer decent details about the participants’ careers. 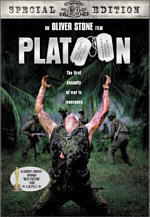 This special edition DVD of First Blood offers its second release in the format. The first one came out in October 1998 and shared some supplements. Actually, everything here also appeared on the old disc except for “Drawing First Blood”. From the original, we lose a featurette and a trivia game. However, if you buy the Rambo Trilogy boxed set I discuss at the end of this review, you’ll get those features. Neither is missed here, though, especially since “Drawing First Blood” is very good. By the way, I never saw the original disc, so I can’t compare audio and video. Apparently the DVD included anamorphic widescreen; I don’t know if this new one uses the same transfer or not. The sound definitely differs, as the original provided only Dolby Surround 2.0 sound instead of this one’s 5.1 tracks. 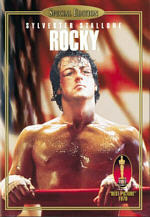 Although the sequel made Rambo a household name, I think only the original film stands up after all these years. First Blood has its flaws, but it generally offers a vivid and compelling action flick that also includes more depth than usual. The DVD features very good picture and audio, though only DTS users will get the best of the soundtrack; the Dolby Digital mix seems acceptable but not as strong as the DTS one. The package also tosses in an excellent audio commentary and a short but solid documentary. Action fans should definitely give First Blood a look, and this DVD creates a compelling version of the movie. Note that this special edition DVD of First Blood can be purchased on its own or as part of a four-disc set called the Rambo Trilogy. The latter also includes sequels Rambo: First Blood Part II and Rambo III as well as a fourth DVD that provides a mix of supplements. Each of the three films can be found individually, but the “bonus disc” appears only as part of the Rambo Trilogy. If you like all three flicks and enjoy supplements, that package offers a good bargain, as it retails for $59.98, or the price of the three movies on their own.